My husband likes to draw a face or design on both sides of the balloon, since the balloons twist in the wind. Once the balloon is done, tie the string on the balloon knot. Next comes the tricky part. With the scissors carefully slit one side of the large white trash bag. At the opposite end of the slit, cut a small hole for the string. Thread the string through the hole so the bag flows around the balloon. Remove bag’s drawstring. 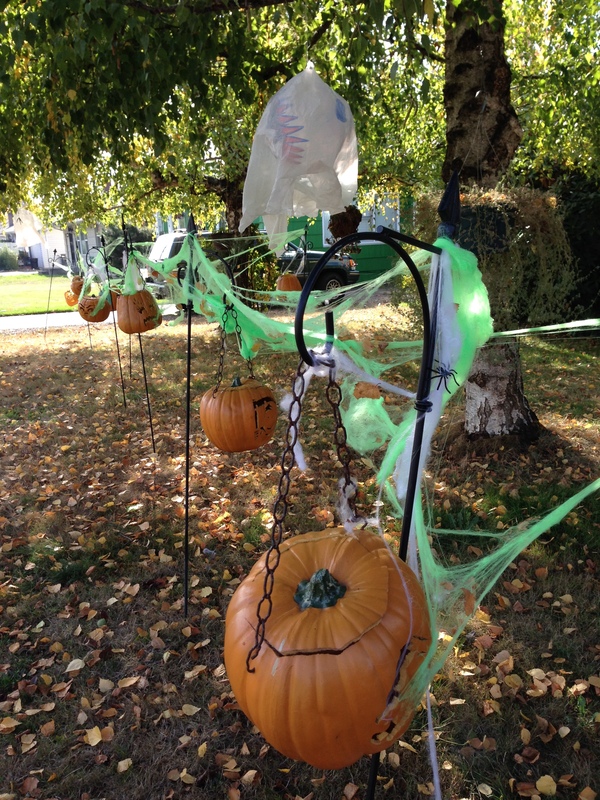 Ribbon and a fake pumpkin….. yup. I like it. But it did not start that way. Sometimes I have this idea and I think, that will look great. Then I try it. Below is my first attempt. Hummmm, this looked better in my head than it did in real life. So, I didn’t give up. I just took it apart and tried something else. There’s a moral in there somewhere. While thinking about our grandchild’s birthday party at a park, I wondered what field games could be played with the variety of ages in attendance. My brother, who was visiting at the time, introduced us to Kubb, a game from Sweden he had heard about. There was a great deal of information on YouTube and Google about the game. A few of us watched several videos and thought it would be a splendid game….and one we could make rather “easily.” Lincoln and I discussed colors and how to change the original rules to something more birthday-friendly. My husband, who can make anything, bought a couple of dowels, a piece of wood, and gathered some wood from a wooden pallet. He cut everything to size and rough sanded the pieces. I took over the blocks and painted them with used paint from the garage. It took a while, but it helped to give the wood two-three coats. The next step took the longest. I taped off each block and baton in preparation for the colors. To say this step took hours would not be hyperbole. Still, it was fun to see the colors bring the set to life. Once the set was painted two or three more times, everything was handed back over to my husband who sprayed a sealer on the entire set. Yes, several coats. The game turned out to be a lot of fun. After the kids played a couple of games, the adults played as well. It was a success, and a game I hope we will play for years to come. Hubs and our Halloween decorating used to start after we left work on the day. We would light some candles, throw sheets over the furniture, turn on the porch light, and greet the kiddos. Once we had grands, it became a different story. We now begin early and have eager hands helping. Since Alaska, I’ve been drawn to ravens and crows. So when I spotted this picture from Better Homes and Gardens (.com) I thought….oooooooooo Below is the picture from the site. 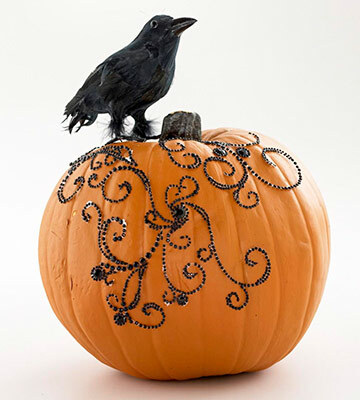 I used a purchased faux pumpkin because I am NOT going to put those rhinestones on every year. However, I’m pleased with the grouping and it sits on one side of our fireplace mantel. The top part of the front window has sheer material with figures that show from either side (inside the house and out). 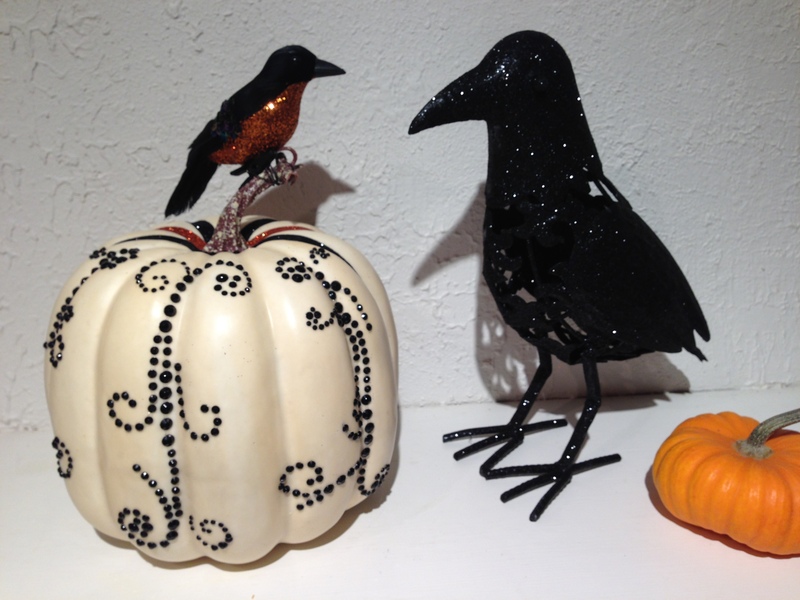 I purchased the paper cats, but crafted the pumpkins using black paper on either side of sheer orange material. A pumpkin garland tops it off. 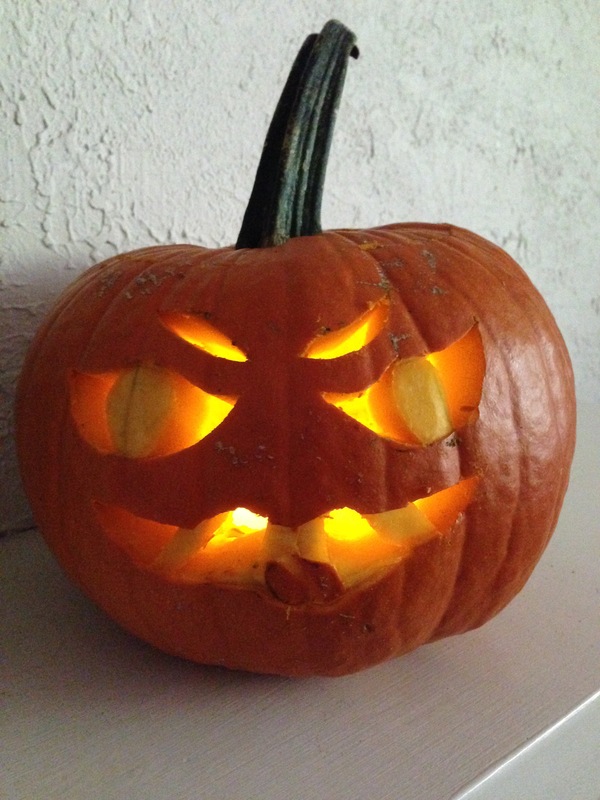 2015 is eventful because we attended two pumpkin carvings: One was a neighborhood event, with a delightful group sitting around a table carving pumpkins and sharing stories. 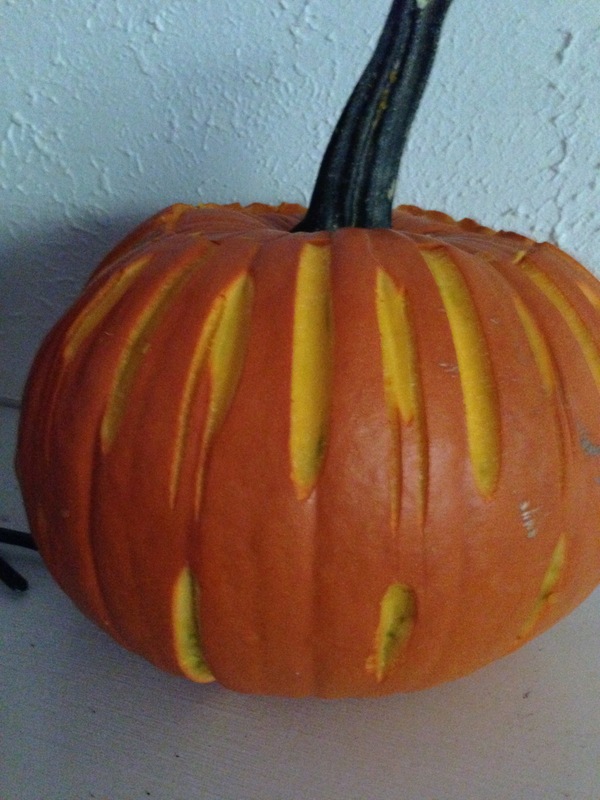 Robert’s pumpkin is great. Mine…meh…I tried a new “shaving” tool and was not so pleased. Sometimes it does not work out. There were at least three generations of newbies and old friends to chat with. Robert brought a “ghost” pumpkin and did a great job. 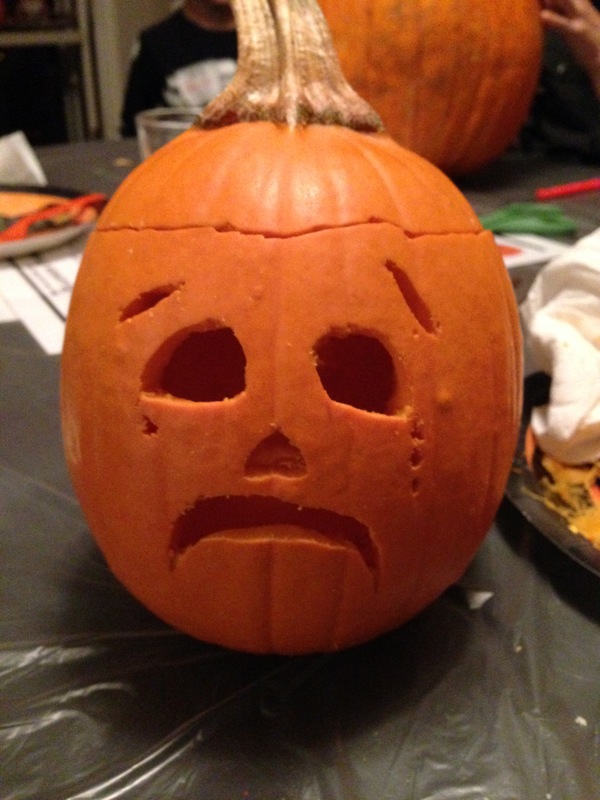 Since scary faces were to frighten away evil spirits, I thought I’d make a little sad pumpkin to scare away the blues. Succcess. This same party planner, used to line his sidewalk with rod iron plant hooks, holding faux pumpkins he carved with a rotary tool. 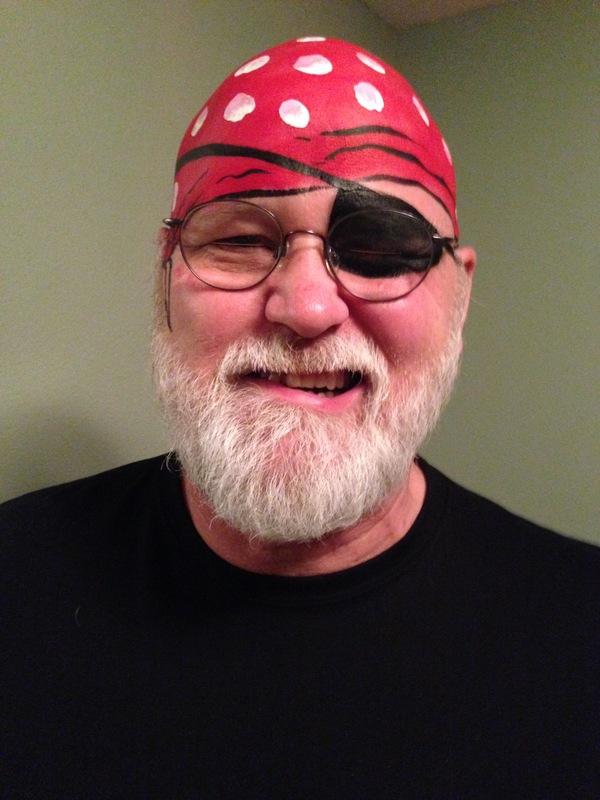 After a decade of holding the parties, he decided….no more parties (logistics alone — mercy!) and gave away most of his outside items. We were the lucky recipients and have enjoyed them each year. 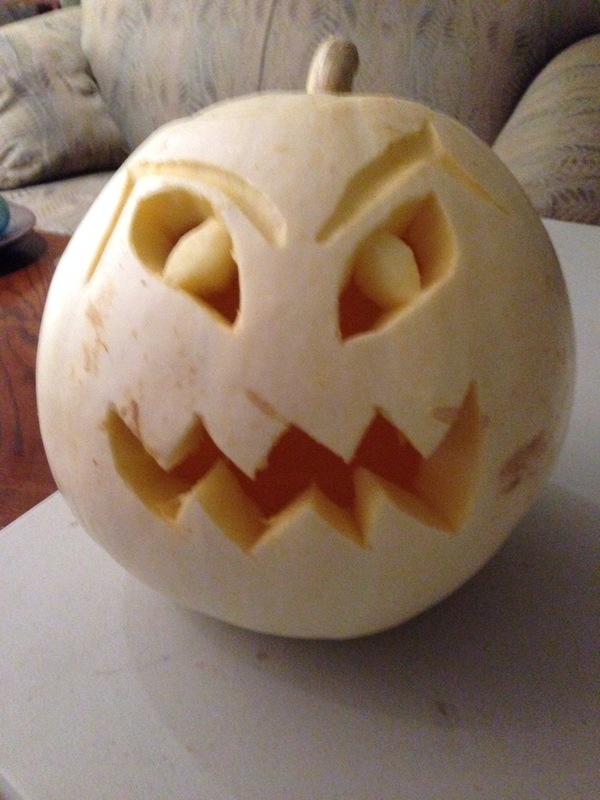 While he changed his mind about no longer hosting the parties, he knew his former pumpkins had become a tradition in our household. The grands can’t wait to put them out each year. Robert and the grands also make balloon ghosts. So we are set to go! Candy in the pantry, pumpkins on the porch. Neighborhood trees are graciously doing their part decorating the ground with all the colors you’d want for a Halloween landscape.